NDA constituent Lok Janshakti Party has upped the ante against Modi government over its demand to restore the SC/ST Act and removal of NGT Chairman. Declaring that it was “running out of patience”, NDA constituent Lok Janshakti Party (LJP) on Friday warned of an agitation if an ordinance to strengthen the SC-ST Act was not promulgated and the Chairman of the National Green Tribunal not removed by August 9. 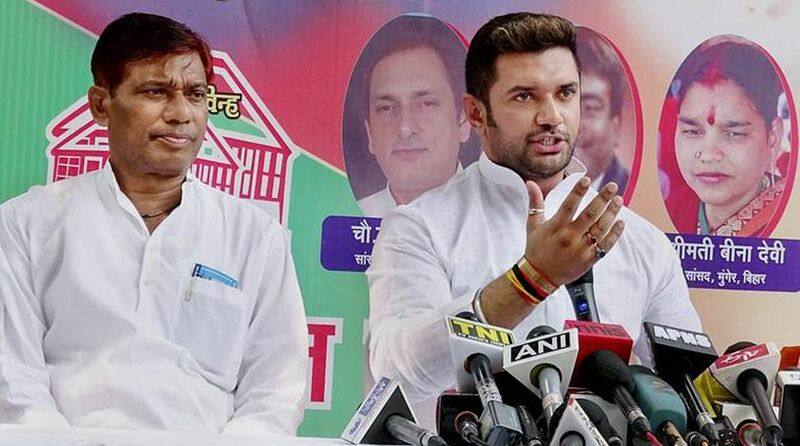 Addressing a press conference, Chirag Paswan, party MP and son of Union Minister Ram Vilas Paswan, said people from the SC and ST communities were feeling betrayed as the BJP-led NDA government had not issued an ordinance “as yet” to overturn the Supreme Court’s March 20 order that “diluted” the original SC-ST (Prevention of Atrocities) Act and on top of that appointed Justice AK Goel, “who ruled against the Act”, as NGT Chairman. “We are running out of patience as no action has been taken to restore the Act as yet. On April 2, agitations were held across the country. Similar agitations have been announced by some organisations on large-scale on August 9. We want the government to bring an ordinance to restore the Act before that. Our Dalit Sena will take to the streets if it is not done,” he said. He said the government’s decision to appoint retired SC judge Goel as Chairman of National Green Tribunal (NGT) had sent a message to these communities that the government had awarded the judge who was one of the judges of the two-member bench that ‘diluted’ provisions of the Act. “We have been asking the government to restore the provisions of the Act as soon as possible as people are sad and disappointed with the SC order. Also, Goel’s appointment as NGT Chairman is being seen as an award,” Paswan said. The Chairman of the LJP Parliamentary Board demanded the introduction of reservation in private sector jobs and placing reservation in the 9th schedule of the Constitution to counter the Opposition charge that the government was bent on ending quotas in education and government service. Replying to questions, the Jamui MP said party President Ram Vilas Paswan would decide the party’s next course of action based on the government’s response to the demands. He said the party had faith in Prime Minister Narendra Modi but expressed concern if the government was listening to the appeals and demands made by the party. “Had the government been listening to us, the situation would not have come to this pass,” he said. Paswan said the party had aligned with the NDA (National Democratic Alliance) since it was assured that the interests of people from the SC and ST communities “would not be hurt”. He also added that his party was still with the government and was pushing for its demands while being within the government. “We will not take any step like the TDP”, he said in reference to the ruling party in Andhra Pradesh, which quit the NDA earlier this year over the demand for special category status to the state.